On its two-year anniversary, the CDOT-operated Bustang bus service has seen a 77 percent increases in ridership on its Western Slope route to and from Denver. Statewide, that contributes to 52 percent in usage gains. The Colorado Department of Transportation’s 2-year-old bus experiment known as Bustang has seen overwhelming ridership gains and is now eyeing future expansion. The three-route system that launched in July 2015 includes a line connecting Denver’s Union Station to Frisco, Vail, Eagle and Glenwood Springs. New data shows that during the program’s second year of operation, the number of riders grew by more than 50,000 for a 52 percent increase in usage — almost 15,000 on just the west route to nearly 34,000 riders, accounting for a 77 percent jump. Heading the opposite direction, west, one-way from the Frisco Transit Center to Vail costs $5, to Eagle is $10 and to the final stop in Glenwood Springs is $17. And then round-trip from Frisco to Denver runs $24. And that’s exactly what CDOT intends for the popular 51-seat, Wi-Fi-enabled coaches. Weekend buses will be added to both the north route between Denver and Fort Collins and the south route to and from Colorado Springs starting this Sunday, Aug. 20. New specialty services include a Mile High Stadium service for all Denver Broncos home games, as well as a separate student and faculty route from the Colorado State University campus in Fort Collins to Denver. New stops in Grand Junction on the west route and Castle Rock on the south route are also planned in the next year. That’s all on top of the weekend service that began on the west route a handful of months after Bustang’s launch, a seasonal third express line from Glenwood Springs to Denver starting mid-December, as well as the Idaho Springs stop that kicked off this past January. 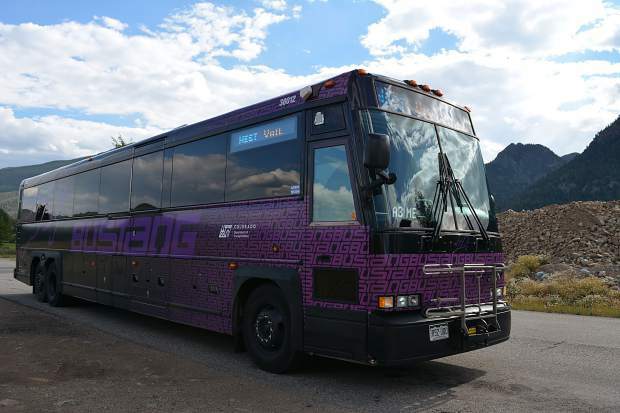 A bus line that did not perform well, however, was the SnowStang service, which connected Denver with stops at six ski resorts: Winter Park Resort; Arapahoe Basin Ski Area, Breckenridge Ski Resort and Keystone Resort in Summit County; and Vail Mountain Resort and Beaver Creek Resort. Timlin said, based on website traffic, interest was high for the test runs two Saturdays in February, but that did not translate into sales probably because of the $45-$60 round-trip fares depending on the resort. At cheaper regular rates along the Western Slope — round-trip is $10 between Denver and Idaho Springs, $34 for Vail — passengers are seeing the benefits to not using their own cars. That helps decrease highway congestion, use of fossil fuels and the cost of living in the pricey resort communities. Summit County plans to eventually offer an even better user experience for its free local Summit Stage and interstate Greyhound Lines ticketed bus services, in addition to Bustang. Discussions and movement continue forward on the projected $8 million Frisco Transit Center renovation. The project remains in a conceptual-design phase, but construction on the two-year build-out is expected to begin next summer. CDOT is contributing millions of dollars in grant funding to the reimagined mountain mass-transit hub through the Federal Transit Administration, and it’s currently scheduled for completion sometime in fall 2019. For now, Summit residents will have to settle for Bustang services.